Sarah has been especially spunky lately and there are lots of things I’ve been jotting down here and there, saving them for a memory-keeping post. So here we go. 1. Before our Memorial Day Beach Trip the kids and I headed to the store to pick up a few items. On our list was a bathing suit for daddy. When I told Sarah this she responded with, “a big fat bathing suit?” Which, of course, is even more hilarious if you know my bean pole husband. 2. McDonalds is officially “Big Donalds”. And if anyone corrects her I may have to get a little crazy on your so watch it. 3. Sarah’s last day of preschool was a few weeks ago. I told her several times that it was her last day of school. I think she liked the “last” concept. In the past week she’s told me no less than three times that it was her “last day for soap”. I just kind of shook my head and marveled at her toddler randomness, thinking nothing of it. Until two days ago I caught her washing her hands soap-less after going potty. When I reminded her to get a squirt of soap she said, “NO! It’s my laaaaast day for soap!” Oh my. Her random toddler words had actually translated to action (or inaction as it may be). After stating that only big girls who did all of their potty things correctly (including using soap to wash hands) would get dessert she quickly discarded her “last day for soap” ideas. 4. If you ask Sarah where something is, say your sunglasses that she definitely was playing with just five minutes ago, she’s sure to respond with “it’s somewhew”. Nice. Thanks for the details kid. 5. Tonight on our way home from my mom’s Brent was encouraging Sarah to sleep in her carseat. He told her it was “past her night night time” to which she responded, “just like Pastor Steve!” HUH? It took a minute for this mommy’s brain to catch up. But when I did I realized that when Brent said “past your night night time” that Pi’bears heard “PASTOR Night Night Time”. Which made me chuckle. And then brought to mind several “Pastor Night Night Time”s I’ve heard in my life. And for the record, Pastor Steve isn’t one of them. Of Her Royal Toddlerness applying “special cream” a.k.a. 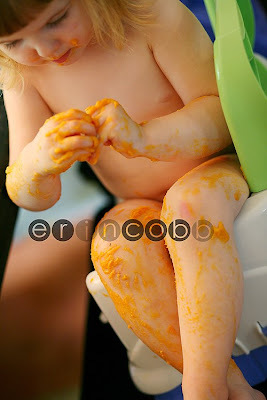 Ephraim’s homemade sweet potato puree. She’s a big fan of having her own bowl of baby food as Ephraim’s eating his…but it only took about 10 seconds with my back turned to remind me that turning my back on an eating Pi’bears is NEVER a good idea.